← What is it about Niceville? 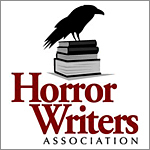 Listen in to tonight’s show as we welcome Amy back to interview Micheal R. Collings, a two-time finalist for the Horror Writers Association annual Bram Stoker Award, once for poetry and once for non-fiction. Micheal R. Collings has written over 120 books, including bestselling horror novels, mysteries, science fiction, non-fiction (with Stephen King as a specialty) and poetry. A professor emeritus from Pepperdine University, he is a professional editor and reviewer as well, with multiple contributions at JournalStone.com, Hellnotes.com, and in the print journal DARK DISCOVERIES. Come have a listen to the best show by authors, for authors. Visit the schedule to see upcoming shows! Tonight’s show is sponsored by The Eyes for Editing. This entry was posted in Journal Jabber Night, Writing Life and tagged Bram Stoker Award, DARK DISCOVERIES, Hellnotes.com, JournalStone.com, Micheal R. Collings. Bookmark the permalink.